The United States government is a crucial partner to the broad coalition of organizations supporting food and nutrition security. By sharing U.S. expertise in agriculture development and developing legislation to codify the government’s flagship initiative Feed the Future into law, families and farmers worldwide can set the foundation to build more independent, prosperous lives. With the bipartisan introduction of the Global Food Security Act of 2015 (H.R. 1567) led by Representatives Christopher H. Smith (R-NJ), Betty McCollum (D-MN), and anticipated introduction of a companion bill in the Senate by Senators Robert P. Casey (D-PA) and Johnny Isakson (R-GA), strong U.S. leadership has reaffirmed that commitment. On March 24, CARE Chef Ambassador Spike Mendelsohn and 10-year-old entrepreneur Cory Nieves of Mr. Cory’s Cookies joined Members of Congress, civil society actors, and government officials to celebrate the growing momentum for sustainable change. The reception featured a series of accounts from food and nutrition security champions in Congress: Representatives Smith, McCollum, Edward R. Royce (R-CA), Chaka Fattah (D-PA), and Senator Johnny Isakson (R-GA), who sent a video statement. We look forward to working with these Members of Congress and others as we develop long-term solutions that support and empower smallholder farmers in developing countries and ensure that those who produce the world’s food can feed themselves and their families. The event also featured a series of encouraging witnesses and remarks from individuals outside of Congress, including: USAID’s Acting Administrator Alfonso Lenhardt; InterAction’s Acting CEO Lindsay Coates; Bill & Melinda Gates Foundation’s Director of Agricultural Development Dr. Pamela Anderson; and Chef Mendelsohn and Nieves. The NGO sector and civil society as a whole understand that change will require more than the efforts of the U.S. government alone – we know the vital role we all play in ending hunger and malnutrition. And many are answering the call. 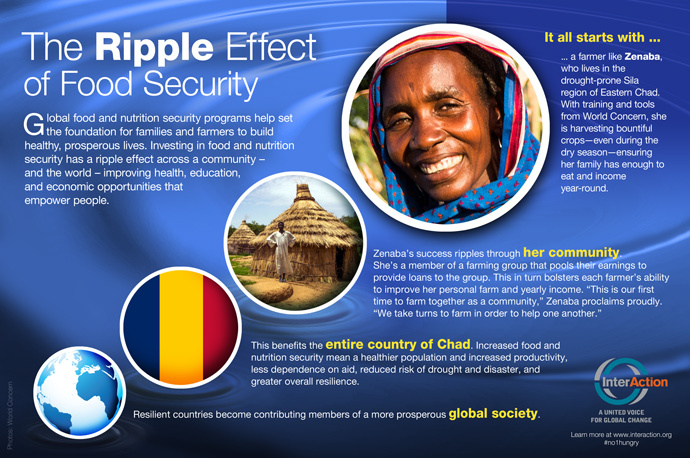 In 2012, InterAction members collectively committed to the Global Food Security Pledge, which promises $1.5 billion in private funding from 2013 to 2015. In 2013, participating member NGOs reported over $600 million in private spending – on track to meet or exceed the $1.5 billion commitment. That call for partnership was evident looking around the room on March 24, as Members of Congress, leaders of civil society, and an abundance of dedicated individuals all agreed to work together to encourage self-reliance and put an end to hunger and malnutrition. Katie Lee is a policy manager at InterAction, an alliance of more than 180 U.S.-based NGOs, and formerly served on the Republican staff of the Senate Foreign Relations Committee.